Can you identify anyone in this photo? Click the photo to see a larger image. The majority of the APRL’s APS Archives collection is organized into boxes chronologically and was inventoried by intern Robbin Zirkle in the summer of 2011. We have been publishing Robbin’s inventories in the Philatelic Literature Review, and the 4th quarter 2012 issue will include the 1950s inventory. The APS Archives also include material that has not yet been inventoried, such as a collection of panoramic photos from APS meetings. 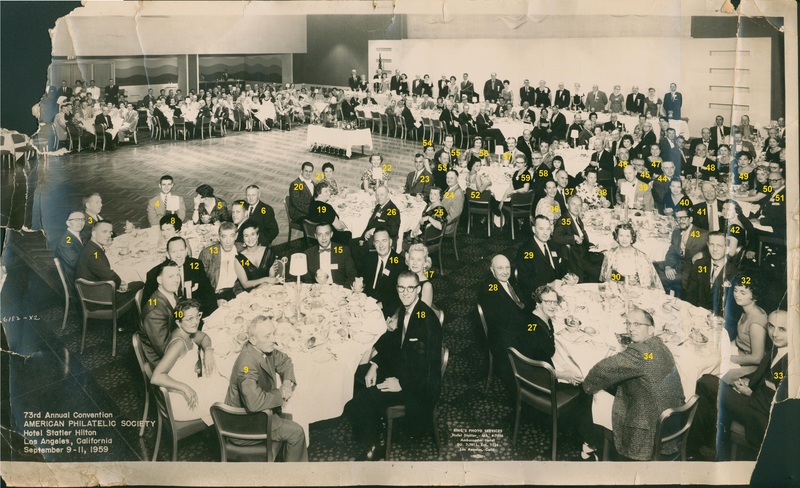 We recently received a photo of attendees at the 1959 APS Convention in Los Angeles from Eric Jackson. Eric was able to identify a few people in the photo. Are you able to identify anyone else? We’ve numbered the most recognizable people in the photo. 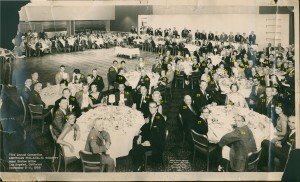 Leave a comment with the number and name of anyone you can identify. 12. Frank Q. Newton, Jr.
On the back of the photo, there are a few additional names, though without any clue as to where they are in the photo: Manley Hall, George Turner, Pat Herst, Joy Tinsley.